The mod adds to the game 5 magic rings. If you wear the ring you are special abilities, such as flight or invisibility. How to make a ring? 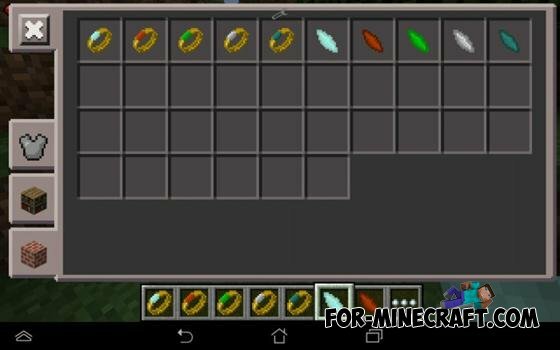 To craft the basics you'll need seven gold ingots and a single crystal. Gold may be obtained from ground ore after remelting. For the ring requires a crystal. Production of crystal is the most difficult, because killing mobs, there is a chance that 1 in 100 will drop the crystal. For quick can find spawner mobs and killing them, get the crystal. How to use the ring and what it does? Click on the ground to use the ring. Ring of Invisibility makes you invisible, use it in the mode of third persons, to make sure that the mod. Ring of Fire will allow you to never take damage from the fire. Life ring will allow to become untouchable (almost) any punches with damage to more than 10 will kill you. Air ring will allow to fly. Ender ring enables ridiculous retreat to the place where you click (click on the ground).